NANDRAD is a modern building energy simulation platform for the dynamic analysis of the energy efficiency of a building. It has been developed especially for calculation of complex and large buildings, and to handle the large amount of data for such building sizes. At the same time, the integrated physical models are quite detailed, which is meaningful for a dynamic description of the building behavior. In particular, massive construction form in the European area are well represented by spatially discretized constructions. The resulting physical models place high demands on the numerical integration engine. Hence, the NANDRAD solver was specifically developed and optimized for building energy simulation, and uses state-of-the-art technology in embedded numerical algorithms. Besides intern equipment and control models, NANDRAD supports runtime simulation coupling based on the Functional Mockup Interface (FMI), Standard 2.0. Through this it is possible, to combine detailed equipment/HVAC system models and components, mostly on the supply side, from specialized simulation tools/libraries (z.B. Modelica) with the NANDRAD building energy simulation. Creation of the building (BIM) model: Bindings to established graphical preprocessing tools such as the DesignBuilder user interface, or the BIM-HVACTool software. 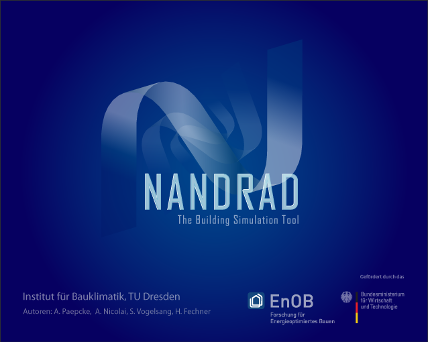 Building energy simulation: NANDRAD-building energy simulation to determine energy consumption. Summer thermal comfort: Simulation of the thermal comfort under summer conditions. Equipment sizing and performance simulation: NANDRAD-building energy simulation is sufficient for standard cases. For more complex equipment and control system models, the FMI tool coupling between NANDRAD and external equipment simulation models is being used. Consideration of building mass: detailed representation of thermal storage and transport processes in spatially discretized constructions. Simulation of complex buildings: efficient data format and optimized memory storage structures allow simulations of detailed buildings with many zones and spaces. Efficient solver technology: high simulation speed through application of error controlled simulation methods and problem-specific solution algorithms (preconditioned Krylov-Subspace methods). Modular and extendible: via generic interfaces new equipment systems and control algorithms can be incorporated. The registration of components and their evaluation order is done using graph algorithms. Networking capability: Support of the FMI 2.0 tool coupling interface for ModelExchange and CoSimulation to couple simulation models and external equipment and control modules at runtime. Applicability in the planning process: Additional tools (helper and converters) are provided for BIM data import, FMU export, and use of the simulation component within other simulation environments (for example, SimulationX).